This may not be the Oscars but Sarah Paulson has us doing a double take. The seasoned American Horror Story actress stunned on the Golden Globes red carpet in a literally dazzling Marc Jacobs gown. Paulson, who later went on to win the Golden Globe award for Best Actress in a Mini-series or Motion Picture for TV for her portrayal of Marcia Clark in American Crime Story: The People vs O.J. Simpson. 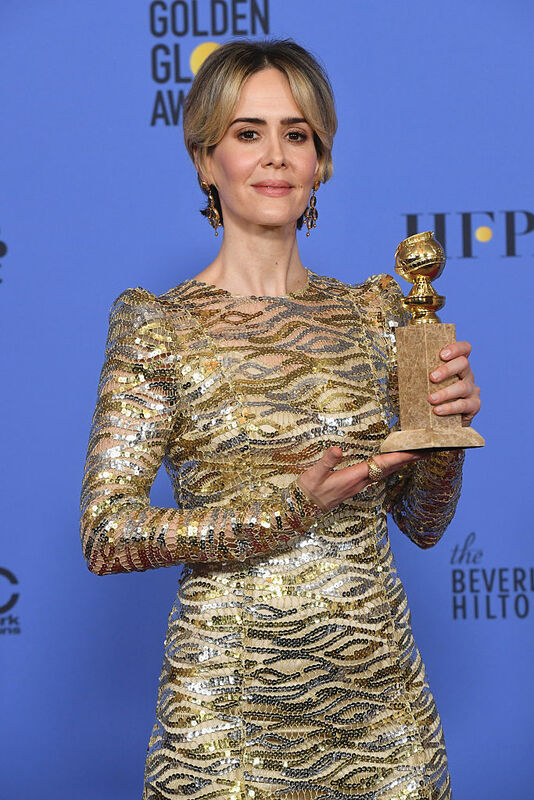 Not only is Paulson’s dress stunning on it’s own, it also looks ~amazing~ paired with her brand new Golden Globe. "Oh, my god, I feel like I'm going to faint, I want to thank the HFPA for this incredible honor. You have always been so kind to me. And I would like to thank everyone at FX for support, and Dana Walden, Gary Newman, everyone at 20th Century Fox. To our incredible cast, this merry band of gypsies, you're all heroes to me. I would not be standing here if it were not for each and every one of you." “To Marcia Clark, you are an inspiration to me, if I could live my life with a fraction of your wit, integrity, an unapologetic fierceness, I would be on the road to doing it right. Thank you." Awww, we’re so happy for you Sarah!